Feeling Lucky? Like Free Stuff? Enter Today! Did you know, every day, Americans use more energy and generate more pollution in vehicular travel than they do in the production of goods, the operation of commercial enterprises, or the running of their homes? At 28%, transportation is the largest source of greenhouse gas emissions for the first time in 40 years. But here in Philadelphia, it’s a different story. The City’s recently-released “Clean Energy Vision for Philadelphia” reports that transportation represents just 17% of citywide emissions. According to the report, “transportation emissions are relatively low in Philadelphia thanks to residents riding SEPTA and other low-carbon options” – such as biking and walking. On average, commuters who choose public transportation over driving cut their personal transportation emissions by 70%. These commuters also reduce their carbon footprint by one pound for every mile they don’t drive. This month’s contest is so easy! All you need to do is name one place you go on SEPTA (instead of driving or rideshare or taxi) and the impact on your carbon footprint. For example: Citizens Bank Park. 5 miles each way = Carbon footprint reduced by 10 pounds! All entries will be eligible for prizes. Top prize is a May Anywhere TrailPass. Ten (10) runners-up will each receive a SEPTA t-shirt. Contest ends 4/22 (Earth Day). Let's Dance - SEPTA Style! What SEPTA vehicle, mode, station, line, destination, etc. is primed to win it all? Is it the Market-Frankford Line - the unsung workhorse of the system? Or our trusty safety dog Paws? How about our new electric buses or the classic Route 15 trolley? SEPTA Bracket Winners will match that of the NCAA Tournament - for example - if (9) UCF beats (8) VCU then (9) Temple Station beats (8) Cecil B. Moore Station. Enter your SEPTA Bracket Pick Winner for the overall tournament below, plus a tiebreaker (combined score of the NCAA Championship Game on April 8, 2019) by Thursday, 3/21 at 12p. The grand prize winner gets a SEPTA Prize Pack - which includes a $50 SEPTA Key Card and a SEPTA T-Shirt! Max four (4) entries per email address. Click here to check out the SEPTA Bracket and decide on your winner! Now through the end of the Sixers season, tune-in to Sixers Pregame Live on NBC Sports Philadelphia and listen for the SEPTA KEY TO SUCCESS. Enter the SEPTA KEY TO SUCCESS below and you'll be entered to win a Sixers Prize Pack. 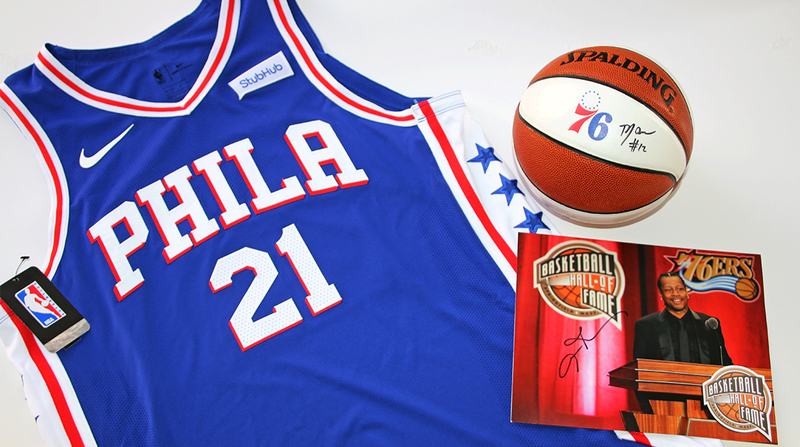 This Prize Pack includes an authentic Joel Embiid jersey, a mini basketball signed by TJ McConnell, AND an Allen Iverson Hall of Fame photograph signed by AI himself! Winners of the Prize Pack will be announced at the end of the Sixers regular season. Multiple entries allowed - so tune-in and enter as often as you can! However only one entry per pregame and per game per day. To keep it interesting, we'll giveaway ten (10) SEPTA t-shirts at the end of every month to ten (10) lucky entries. Ends 4/10/19.